It's a yay! Sunday, 3 June 2012, Mother Monster was cancelled to come to Jakarta for her Born This Way Ball concert, but don't be sad for book lovers! 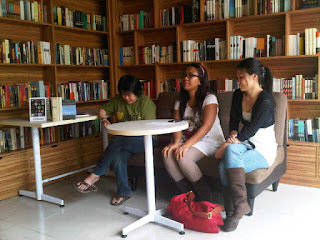 At Reading Room, Q!Stories and Club Camilan books were on the spotlight in "Creative Writing and the Evolution of Q-literature in Indonesia" discussion. We made it! For almost two hours, we all had a full and fun informal discussion with the speakers about book publishing, creative writing and the Q-lit themed all the way from the 70s till today. We got tips and fresh insight as newbie writers. One quote to remember from Hetih, "I always got 6 (out of 10) for my language subject at school, but today I'm working as a fiction editor." So, it's clear, keep on writing no matter what lies on your way (if you want to), or, you, readers, can always maintain your love to literary by keep buying and reading books.